This is a full day high level training class for experienced Harmony Gelish Dip users to gain expert application skills. Available only with Nail Harmony Master and Doctorate Educators. On successful completion of this course, Students will receive a Guild Accredited Certification which is acceptable for industry insurance purposes. This course carries 13 CPD points. This class forms part of the Nail Harmony PhD Syllabus. There are six parts to this syllabus and on successful completion of all parts you may request an online exam code. On successful completion of this online exam, you will gain the coveted Nail Harmony PhD Nail Artist Certification. This is a full day high level training class for experienced Harmony Gelish Polygel users to gain expert application skills. Available only with Nail Harmony Master and Doctorate Educators. A Guild Accredited Course for safe use of an electric nail file and carbide bits (3 HOURS). Students must have a minimum of 3 months certificated L&P acrylic, Polygel or Dip experience. This class covers the safe removal of gel polish from enhancements, the speedy prep for removal of acrylic dipping systems, and safe cuticle prep using an e-file. Pro Power 20K E-file and bit set including carbide barrels bit and diamond football bit are a compulsory purchase with this option. 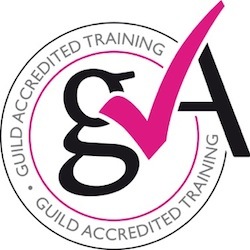 Students will receive a Georgie Smedley Ltd Guild Accredited Certification. This course carries [ ] CPD Points. This is a 1/2 day training course for students with existing Gelish Polygel experience wishing to learn basic design techniques. Full Student Kit & Lamp essential. This is a basic one day training class for experienced soak off gel polish users wishing to convert to Gelish or those with a minimum manicure certification to gain basic Harmony Gelish Soak Off Gel knowledge and application skills. You will not cover the more advanced application techniques, such as Structure Gel application over tips and/or sculpting forms and filing techniques, Vitagel application, etc. The brand new Innovation-PolyGel, a hybrid system that sits between Acrylic & HardGel systems, that is exceptional to work with and stays where you put it. POLYGEL is an all-in-one formula for the perfect working consistency. No monomer, no odors, no mixing, no ratios. The formula allows you to work as fast or as long as you want. Tube dispensing allows you to use just what you need for no wasted product. Patent-pending TriPolymer* formulation combines acrylic powder for strength in a gel base with photo initiators providing workability and no odour. THE BIGGEST PRODUCT BREAKTHROUGHIN ENHANCEMENTS! PolyGel-Like Putty in your hands! This is a 1 day training course for students with existing experience in nail extensions systems wishing to learn basic Polygel one-colour application techniques. Product chemistry, product uses, safe natural nailcare, natural nail preparation in readiness for one colour application over tips. There will also be a demonstration over sculpting forms, filing techniques, infills, removals and troubleshooting. This course carries [ 11 ] CPD points. This Refresher Course is suitable for those who wish to re-take a class they have already attended with Nail Harmony in order to refresh, recap and troubleshoot. You will attend a further full day in the system you have already trained in and on an existing class where there is space available. Please contact your local Educator and they will take the booking for you. AMAZING PAY AS YOU GO DEAL! £42.69+vat course discount & £65.21+vat kit saving = £69.75+vat!! This is a 12 week Pay As You Go complete training course for students wishing to learn full PolyGel application techniques. This entry level course is suitable for complete beginners to the nail industry and also for people who wish to refresh or improve their current knowledge. Thorough theory is covered to include hand and nail anatomy & physiology, Health & Safety, salon hygiene, anatomy & physiology, nail diseases/disorders and contraindications, client consultation and homecare advice. Practical section covers perfect natural nail prep in readiness for nail products and enhancements, to include tip application, form application and safe filing techniques. Product chemistry, product uses, safe natural nailcare, natural nail preparation in readiness for one colour and pink & white applications, application over tips and sculpting forms, filing techniques, infills, removals and troubleshooting. This course carries 38 CPD points. *PLEASE NOTE-THE LED LAMP IS NOT INCLUDED IN THIS PACKAGE. If you already have a Gelish 18G then please bring along with you. If not, please add one in booking stages when prompted. **You will need to purchase further tubes of PolyGel (a minimum of 2, a white and cover pink) around the 3rd or 4th date. These are purposely not included so as to make initial costs more affordable to you, therefore spreading the cost a little. This is a one day training class for experienced nail enhancement technicians wishing to train in Gelish DIP. Students MUST have Manicure Certification and training in Tip application (i.e. half day Nail Essentials or equivalent training with another brand) prior to attendance. This is a one day seasonal designworkshop for experienced Gelish Gel Polish users to gain seasonal design application skills. Must have attended a Gelish 101 Translation or Gelish 101 Comprehensive class prior to attendance. A minimum of 6 winter designs suitable for the holiday season. Harmony Workshop certification on completion. This is a 3-day complete training course for students wishing to learn full PolyGel application techniques. This course carries 32 CPD points. THE BIGGEST PRODUCT BREAKTHROUGH IN ENHANCEMENTS! This is a 2 day complete training course for students with existing experience in nail extensions systems (or Nail Essentials Course) wishing to learn full application techniques. Product chemistry, product uses, safe natural nailcare, natural nail preparation in readiness for one colour and pink & white applications, application over tips, filing techniques, infills, removals and troubleshooting. The 3 Day Comprehensive course covers sculpting over forms. However, Day 3 can be added as an optional extra following completion of the 2 Day Translation. This course carries [ 22 ] CPD points. This one day entry level course is suitable for complete beginners to the nail industry and also for people who wish to refresh or improve their current knowledge. No gel or acrylic products are used on this course as although it is a stand-alone class for people wishing to learn or improve their tip and form application skills, it also forms Day 1 of our 4 day classes in all of our systems. Students can move on from this class to 3 days in either Gelish Gel Polish, ProHesion Acrylic or Gelish Hard Gel. This course carries 9 CPD points. This half day course is suitable for those who have previously attended a Harmony Nail Essentials Course (having therefore covered the theory element of a Manicure Class), those who already have a manicure certification but wish to learn how to use All That Jazz products, or wish to refresh or improve their current natural nail service delivery. This practical class covers All That Jazz product uses, commercial advice, natural nailcare, nail preparation, hand and arm massage techniques, All That Jazz Nail Laquer painting techniques and troubleshooting. This course carries 6 CPD points. This half day course is suitable for those who have previously attended a Harmony Nail Essentials Course (having therefore covered the theory element of a Manicure Class) or those who already have a either a Nail Harmony, All That Jazz or generic manicure certification. It is also suitable for those who wish to refresh or improve their current pedicure service delivery. In this class you will learn how to use All That Jazz Mani/Pedi products to delivery a pedicure treatment ready for either All That Jazz Lacquer or Gelish Gel Polish application. This practical class covers All That Jazz product uses, commercial advice, natural nailcare, nail preparation, foot and lower leg massage techniques, All That Jazz Nail Laquer and Gelish Application and troubleshooting. This three day training course is suitable for those wishing to learn the application techniques required to apply Harmony Gelish Soak Off Gel Polish over the natural nail and also extending the nails, using tips and sculpting forms with Gelish Structure Gel. Product chemistry, product uses, safe natural nailcare, natural nail preparation in readiness for one colour and French Gelish Gel Polish applications, Structure Gel application over tips and sculpting forms, filing techniques, infills & removals, Vitagel application and troubleshooting. This is a 3 day complete training course for students wishing to learn full application techniques for Harmony ProHesion Acrylic (Liquid & Powder). Product chemistry, product uses, safe natural nailcare, natural nail preparation in readiness for one colour and pink & white acrylic (liquid & powder) applications, application over tips and sculpting forms, filing techniques, infills, removals and troubleshooting. This course carried 32 CPD points. This is a 2 day complete training course for students with existing experience in nail extensions systems wishing to learn full application techniques. This is a one day training class for experienced Gelish Gel Polish users to gain design application skills. Must have attended a Gelish Translation prior to attendance. On this class you will cover colour theory and the application techniques required to create the beautiful entry level designs produced by Harmony Deans of Education. Learn how to create salon viable designs using Nail Hamony's Gelish Gel Polish. On successful completion of this course, Students will receive an Accredited Certification which is acceptable for industry insurance purposes. This is a one day training class for experienced acrylic users to gain Harmony Reflections 3D acrylic design application skills. On this class you will cover colour theory and the advanced application techniques required to create the beautiful Reflections 3D acrylic designs produced by Harmony Deans of Education. Practical section covers All That Jazz product uses, commercial advice, natural nailcare, nail preparation, hand and arm massage techniques, All That Jazz Nail Laquer painting techniques and troubleshooting. This Gelish 3 day training course is suitable for those wishing to learn the advanced application techniques required to apply Harmony Gelish Soak Off Gel Polish over the natural nail and extending the nails using tips and sculpting forms with Gelish Structure Gel. Product chemistry, product uses, safe natural nailcare, natural nail preparation in readiness for one colour and French Gelish Gel Polish applications, Structure Gel application over tips and sculpting forms, nail enhancement structure, filing techniques, infills & removals, Vitagel application and troubleshooting. This three day training course is suitable for those wishing to learn full application techniques for Harmony Gelish Hard Gel (GHG). This gel is a buff off system - not a soak off system. Product chemistry, product uses, safe natural nailcare, natural nail preparation in readiness for one colour and pink & white Gelish Hard Gel applications, application over tips and sculpting forms, filing techniques, infills, removals and troubleshooting. The 12 week Evening Course includes the Nail Essentials Course plus the Acrylic Comprehensive Course. This is suitable for complete beginners to the nail industry, for those who wish to refresh or improve their current knowledge, or anyone who wishes to ADD the acrylic system to their current training. Thorough theory is covered to include hand and nail anatomy & physiology, Health & Safety, salon hygiene, anatomy & physiology, nail diseases/disorders and contraindications, client consultation and homecare advice. Product chemistry, product uses, safe natural nailcare, natural nail preparation in readiness for one colour and pink & white acrylic (liquid & powder) applications, application over tips and sculpting forms, filing techniques, infills, removals and troubleshooting. On successful completion of this course, Students will receive 2 x Guild Accredited Certificates which is acceptable for industry insurance purposes. COST EFFECTIVE - Will complete more than 25 full sets of acrylic nails. This half day course is suitable for those who have already completed the theory behind natural nailcare to include hand and nail anatomy & physiology, Health & Safety, salon hygiene, anatomy & physiology, nail diseases/disorders and contraindications, client consultation and homecare advice. This completely practical section covers perfect natural nail prep in readiness for nail products and enhancements, to include tip application, form application and safe filing techniques. No gel or acrylic products are used on this course as although it is a stand-alone class for people wishing to learn or improve their tip and form application skills, it also forms part of Day 1 of our 4 day classes in all of our systems. Students can move on from this class to 3 days in either Gelish Gel Polish, ProHesion Acrylic or Gelish Hard Gel. This class carries 6 CPD Points. This is a one day training class for experienced Acrylic / Liquid & Powder users to gain Harmony ProHesion knowledge and application skills. A Guild Accredited Course for safe use of an electric nail file and carbide bits (1 Day). Students must have a minimum of 6 months certificated L&P acrylic experience. Students must bring a model with one hand of L&P acrylic extensions requiring and infill of at least two weeks' growth and one hand of newly applied by unfiled L&P acrylic extensions. Pro Power 20K E-file and full bit set are a compulsory purchase with this option. Full full bit set is a compulsory purchase with this option..
Students are required to supply their own e-file that takes standard 3/32 size carbide bits. This is a full day high level training class for experienced Gelish Hard Gel users to gain expert application skills. Available only with Nail Harmony Master and Doctorate Educators. This class forms part of the Nail Harmony PhD Syllabus. There are five parts to this syllabus and on successful completion of all five parts you will be given an online exam code. On successful completion of this online exam, you will gain the coveted Nail Harmony PhD Nail Artist Certification. This is a full day high level training class for experienced Harmony Gelish Soak Off Gel Polish users to gain expert application skills. Available only with Nail Harmony Master and Doctorate Educators. This is a full day high level training class for experienced Gelish Gel Polish users to gain expert application skills. Available only with Nail Harmony Master and Doctorate Educators. On this class you will cover colour theory and the advanced application techniques required to create the beautiful designs produced by Harmony Deans of Education. This is a full day high level training class for experienced Harmony Acrylic / Liquid & Powder users to gain expert application skills. Available only with Nail Harmony Master and Doctorate Educators. This is a full day high level training class for experienced Harmony Reflections Coloured Acrylic Powder users to gain expert application skills. Available only with Nail Harmony Master and Doctorate Educators. To include: Nail Structure, 3D Acrylic Designs, incapsulated and embossed designs, design placement, etc.